How about we start with a lamp table. (Not a table lamp, which is a completely different thing.) A lamp table is a small table that you can put a lamp on. I use pine because I like it and it's nice to work with and you can either stain or paint it. I like the knots. 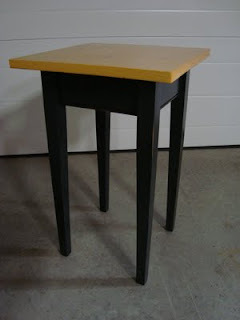 If you are going to paint, you can use poplar which is very smooth and doesn't have knots. My wood starts like this, it's called rough and comes from my local lumber warehouse which is not anything like Home Depot or Lowe's. I have to run the wood through a jointer and planer and table saw to get it to the size I need. You may be able to find wood already planed and ready to go, which eliminates a lot of steps but means you have to get the sizes that are available. 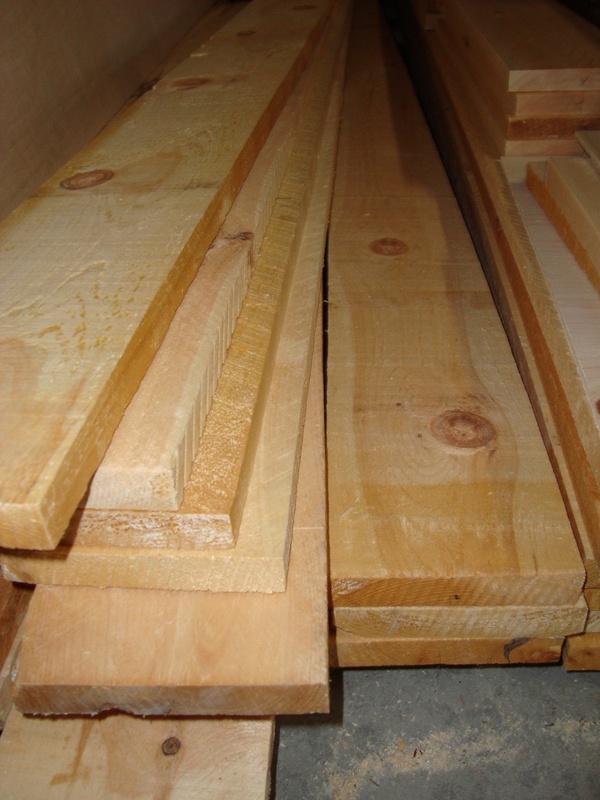 My rough pine is dried to about 8% MC, which is really important for furniture that will be in your house, but that topic is another blog post for the future. The four legs are about 1 5/8" square and then tapered after. They are about 24 1/2" long. You may wish to use dowels to join them to the aprons, or you could alternatively use tenons. 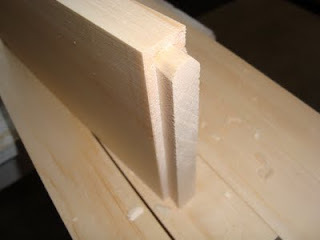 If you are using dowels as joinery, you put two dowel holes in each leg and two dowel holes correspondingly in each apron.I prefer the traditional way, which is sliding dovetails. When you use sliding dovetails everything slips together like puzzle pieces and is very sturdy. 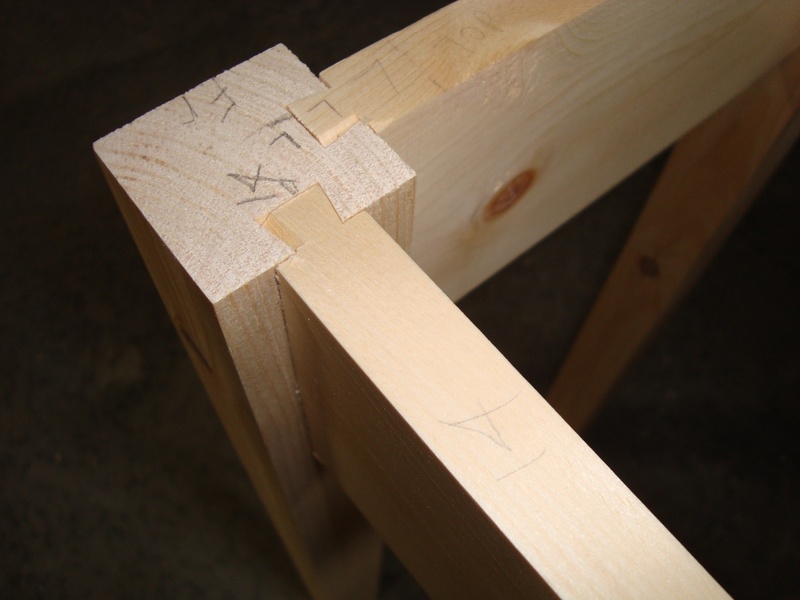 For sliding dovetails, you make the dovetail groove in two adjoining sides of the legs from the top of the leg for a length of about 3 1/2". This is called a stopped groove and is done with a dovetail bit in a router. I find it much easier to first use a straight bit and make a straight groove where the dovetail groove will be. This leaves far less wood for the dovetail bit to hog out. Do your dovetail groove before you put the dovetails on the end of the side pieces. My table has tapered legs. The tapering starts 5" from the top of the leg on the two inside leg faces, which are the same faces that have the dovetail grooves in them, and they head down the leg leaving a 1" square leg at the very bottom. 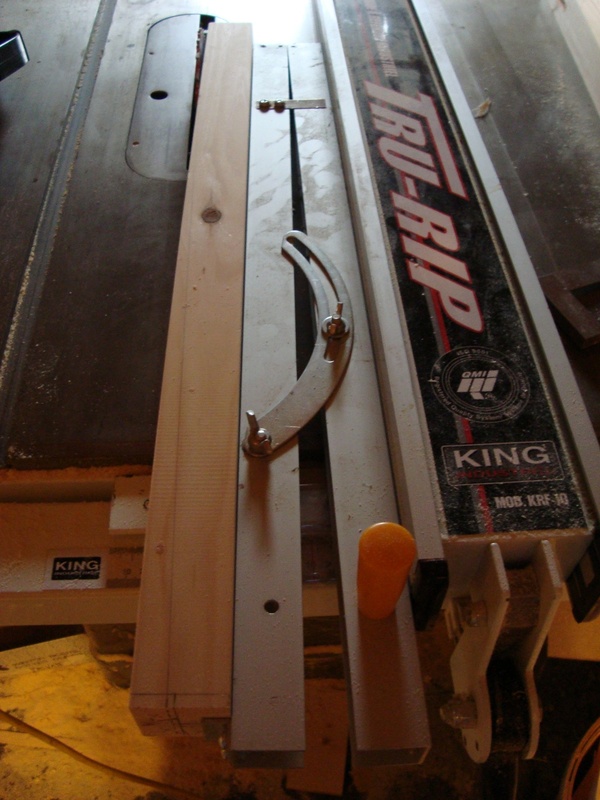 I use the table saw and a tapering jig that I bought. Some make their own jig, but I found one for only about $15 and it was worth it, considering the time I would have spent making it. When you taper, the wood is being pushed into the saw blade at an angle so that the leg is not parallel to the saw's fence. The jig holds it that way, which is the only safe way to do it. 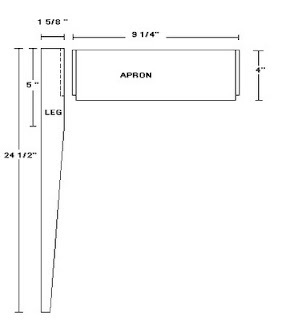 The four side pieces are aprons (or skirts) and are about 4"wide x 9 1/4" long x 3/4" thick. Use the width of the previously made dovetail groove as a sample for your dovetail width that you will put on each end of the aprons. I purposely make my dovetails too large to start and 'sneak up' on the correct size. You don't want it to be too loose in the dovetail groove on the leg, nor too tight. The ends of the bottoms of the dovetails need to be cut off so that when you slide it into the groove it covers the end of the groove. 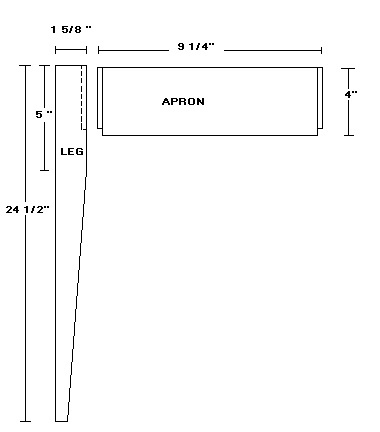 This is why your groove is shorter than the full 4" width of the aprons. If you want, you can put a beadboard edge at the bottom of the aprons. This makes it look a lot nicer than a straight piece, but it's not necessary. The beading is done with a router bit in a router hanging in a table with a fence that you run the apron upright (vertically) against. After a good sanding of all pieces you can slide the aprons into the legs with a little glue. If you put too much it will just come out the top of the groove and make a mess. 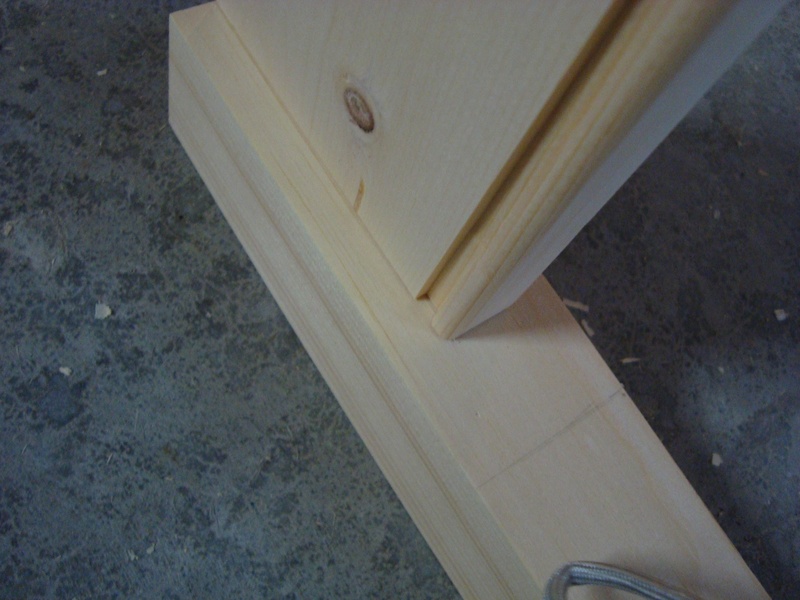 You really don't need a lot because the dovetail does all the work, it really can't pull out. The top is square, 16" x 16" and about 1" thick. I use widths of pine glued together edge to edge to make up the wider piece I need. Usually about 4"-5" widths are okay. If you have them too much wider they can warp. Make sure the edges are completely smooth and perpendicular to the faces before gluing to get the flattest top you can. Use clamps to hold this for a few hours. Bessey clamps are nice. I love clamps, all kinds of clamps except those spring clamp things which I find don't have any holding power. Always make this piece a bit larger than you need and then trim to final size and sand smooth. 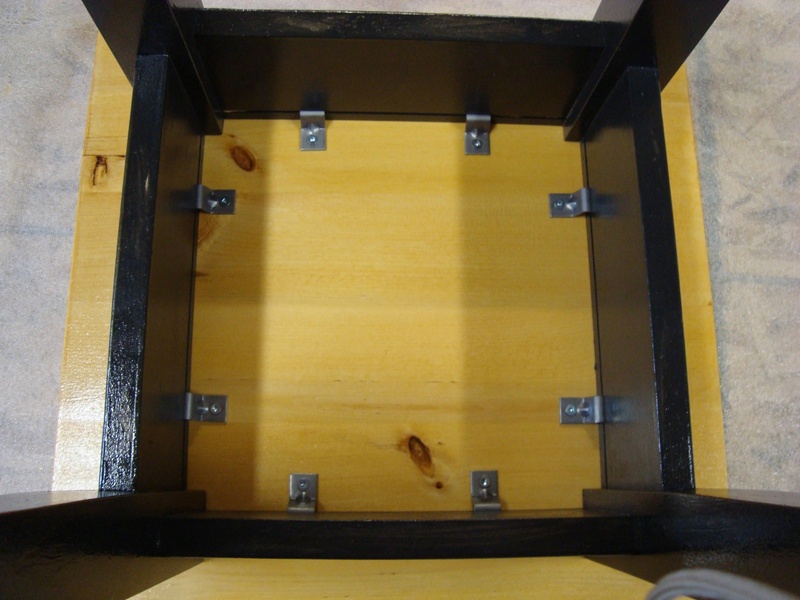 When everything is dry, turn the table upside down and attach two clamps to each apron with screws. You cannot glue the top to the apron and legs, this is why you need these. Wood moves with the seasons, if you just glue it or screw the top on, it will crack. The clamps allow the top to expand and contract with the seasons. Now that is really another blog topic.... wood moves and many people do not realize that. 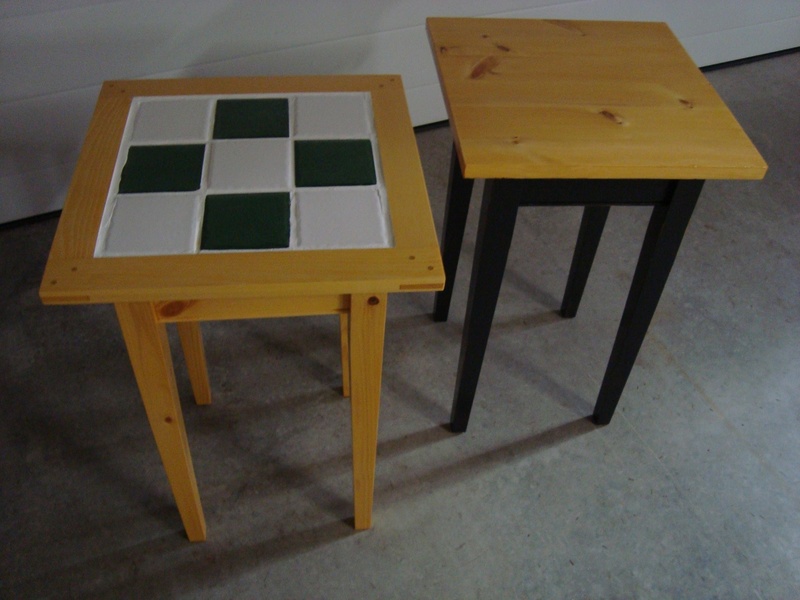 Another lamp table I made has stained legs and aprons and a tiled top in a wood frame. The possibilities are endless. And who says the top has to be square? How about shaped like a flower or any other shape and painted? Hmmmm... so many ideas, so little time!